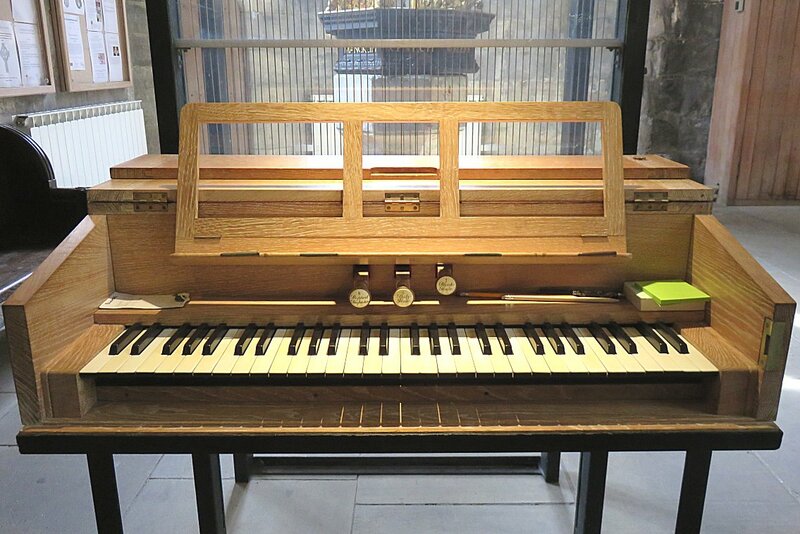 The name of the church (... le Grand) certainly belies the size of its organ, which must be the smallest instrument ever to feature as Organ of the Month. 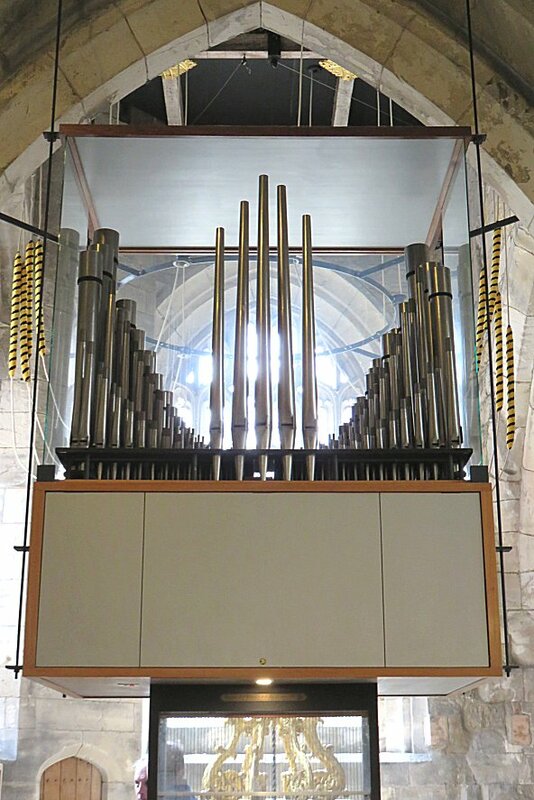 Even so, this tiny 1960s Walker organ was impressive both aurally and visually, with the all-metal pipework suspended in an elevated position directly above the console and the tracker action visible through the enclosing plate glass (see right photo). BOA members particularly enjoyed playing a variety of early music here, including movements from Voluntaries by John Stanley. The church has Norman origins, but the current building is a replacement (by George Pace) after the old church was destroyed in 1942 by an air raid. The Walker organ was a gift from the West German Government and Evangelical Church. At the re-hallowing of the church by the Archbishop of York in 1968 following its partial reconstruction, the inaugural concert was given by Dr Francis Jackson and the Minster Choir. 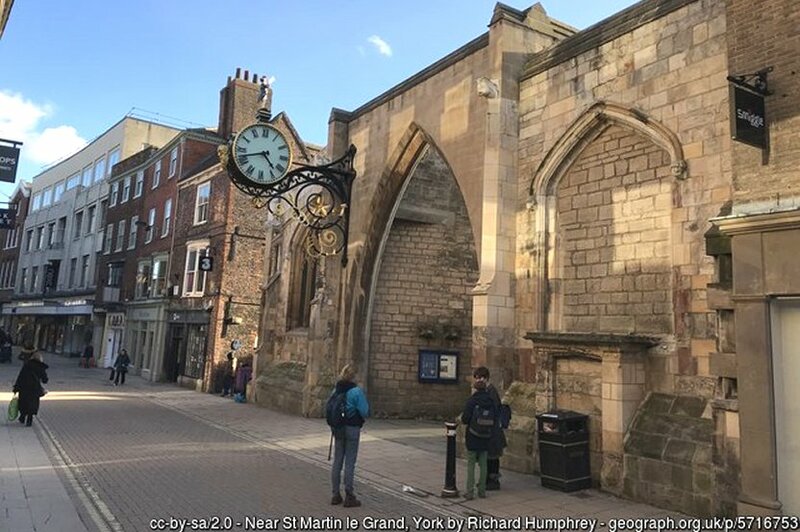 The external church clock (the original version from 1688 did not surivive the fire) remains a distinctive feature of this York city centre street (see left photo). You can hear the choir of York Minster singing as July 2018's Music of the Month.